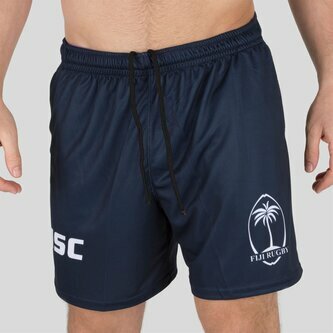 No matter what training your taking part in, introduce some flair of your own when you pull on the ISC Fiji 7s 2017/18 Players Rugby Training Shorts which come in a stylish Navy colourway. These training shorts aren't just perfect all round shorts but they also help you to be extremely competitive, whether you're practising skills, tackling or lifting big weights in the gym, these shorts are sure to become a great training companion. Don't let the simplicity fool as these shorts are built to compete, the 1005 polyester fabric is tough and long lasting whilst offering lightweight comfort with mesh panelling offering breathability and a cooling effect which will have you working harder for longer.